Assured Automation showed the building manager the TM Series PVC Digital Water Meter. 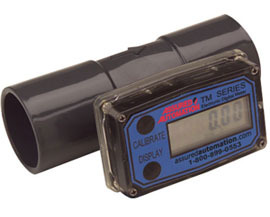 The TM meter is a low cost, battery operated turbine meter with +/- 3% accuracy with field replaceable batteries offering a long working life of 5000 hours and an integral digital display showing flow rate and 2 cumulative totals (1 total is resettable). The TM Series was ideal for this application and was immediately installed on their irrigation water line. The water meter gave a cumulative total that the water authority could read and deduct from their sewage bill. They saw a significant drop in their sewer cost the following month. The meter also provided a troubleshooting benefit. A few months after the meter was installed the building manager noticed that flow was still registering on the meter, even after the sprinkler system was shut down. After an extensive search, they found a break in their irrigation line that was leaking a significant amount of water. It may have gone undetected for months if they did not have the TM meter in line. TM Series Water Meters are accurate, economical and designed to last. They are ideal for water processing and irrigation applications. Meters come in seven sizes with three fitting types. The TM Series is part of our complete range of valves and flow meters, engineered and manufactured to strict quality, performance and dimensional standards. Call us today at 800-899-0553 with your meter or valves questions. This entry was posted in Flow Meter Case Studies, Flow Meters, Latest News and tagged Digital Flow Meters, Digital Water Meters, Irrigation Meters, PVC Water Meters, TM Series digital water meter. Bookmark the permalink.